Bryan posted a blog entry, A friendlier introduction to editing OpenStreetMap, which emphasizes on improving the iD editor walkthrough, a tutorial that guides new users through some basic editing tasks and teaches them the skills and confidence to improve OpenStreetMap. GeoMappando wrote (automatic translation) a great introduction to OSM, that includes data quality, licensing, database layout and the tagging system. This post is the beginning of a series: stay tuned for the second post about database exports and file formats. The proposal to extend the ‘aeroway’ tagging with spaceport infrastructure has been accepted with 15 to 3 votes. The tagging list discusses an appropriate tagging of restrictions for vehicles fueled by liquefied or compressed gas. This applies to underground parking facilities as well as the Chunnel, for instance. This thread on the tagging mailing list reviews tags for truck parking. Ouizi notes that OpenStreetMap is more detailed than any other map provider. Chris Hill noticed new notes around Hull created by Street Complete. He installed the app and expressed dismay that it: added unnecessary information, such as surface=asphalt; and does not inform the user that they are adding them to OSM. Various events took place for the students throughout Avignon as a part of the Education OSM program for this year’s SotM-FR. More information here. The first #Geobeers get together of the Paraguayan OSM community took place in Asunción to discuss new projects. After a failure of the current hard disks, the company Metanet donated 8 SAS disks to the Swiss OpenStreetMap association. This ensures the operation of the server for the next 1 to 2 years. A big thank you to Metanet! Simon Poole released the first draft of the geocoding guidelines. Feedback can be given until the end of June. This year’s AGIT, the “largest yearly conference and fair about geoinformation” will take place (automatic translation) from July 5th to 7th in Salzburg (automatic translation). OSM will be featured. The City of Avignon explains why it uses OpenStreetMap data. 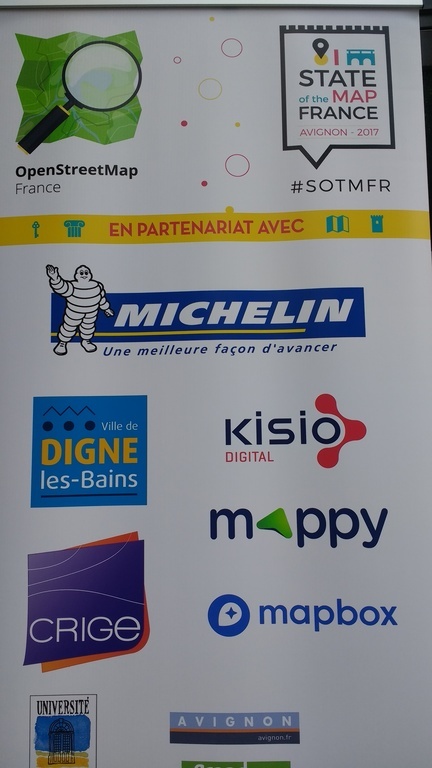 “The” reference for maps in Europe – Michelin – was the main sponsor of the event. … and presentations [Attention – work in progress]. State of the Map US 2017 will be held in Boulder, Colorado, this year over the weekend of October 19th-22nd. Check out their website for more information. David Luswata of HOT US reports about LEGIT team completing the field mapping in Zwedru City. The Global Facility for Disaster Reduction and Recovery (GFDRR) is currently seeking a Short Term Consultant (8 month) who will work in Kampala, Uganda. Attention deadline: June 9th, 2017. Melanie Eckle published the meeting minutes of the HOT board meeting that happened on 1st of June 2017. The Open Data for Resilience Initiative (OpenDRI) is hiring a full-time consultant for their office in Washington D.C.
uMap prepared custom Avignon maps in occasion of SoTM-France. The development (coding) phase of Google Summer of Code (GSoC) started on May 30th. OSM has five accepted projects. In addition students from OSGeo, KDE and Green Navigation will work on applications using OSM data. Andy Allan describes his work on “Factory Refactoring”, a significant change in OSM website codebase that makes the test suite more reliable. OSM data are now available on Amazon Web Services (AWS), as snapshots, historical archives and changesets. Anita Graser reports about a prototype for pedestrian navigation using OSM data. Novel features include: routing through areas, and navigation by landmark (“turn left at the school”). Naviki iOS * 3.60 2017-05-16 Stability in recording increased, reports revised and bug fixes. Mapillary iOS * 4.6.17 2017-05-31 Bugfix release. Naviki Android * 3.60 2017-05-31 Stability in recording increased, reports revised and bug fixes. Locus Map Free * 3.24.1 2017-06-01 Please read release info. Komoot Android * var 2017-06-02 No infos. Kurviger Free * 10.0.27 2017-06-02 Map styles, avoiding unpaved roads and other improvements. Mapillary Android * 3.59 2017-06-02 Improved images upload process and some fixes. OsMo Android 2.4.11 2017-06-03 OsmAnd integration, new remote commands and some bugfixes. A recent post on the Reddit, Data is Beautiful which went viral, shows community animating the transformation of subway maps of 15 cities to actual geography. Wired publishes an article about air quality mapping at hyper-local scale and transboundary impact of global air pollution. Mapbox developer Antonio Zugaldia worked on a connection for Amazon Alexa for navigation and traffic information. Apple plans to improve (automatic translation) their maps by trained crowdworkers. A comment on Heise wonders why Apple wouldn’t use the much better OSM data instead, supporting the OSM community in return, which could mean a win-win deal. The European Space Agency (ESA) announced the release of information, satellite imagery and associated geodata under the CC BY-SA 3.0 IGO licence, as well as an unprecedented prize for Copernicus Masters, the largest international competition in the commercial use of Earth observation data. Last Thursday Japan sent the second of four satellites of their Quasi-Zenith Satellite System into space. They will send GPS compatible signals and augmentation values. Because of their elliptical, geosynchronous orbits the satellites will stay for a long time in the zenith over Japan and will provide highly accurate positioning around 10 centimeters. This weeklyOSM was produced by Anne Ghisla, Peda, Polyglot, Rogehm, SK53, derFred, jcoupey, jinalfoflia, keithonearth, kreuzschnabel, wambacher.